Buzzdock is a dock that sits right below the search bar of your favorite search solution. In addition to the search results you would normally get, Buzzdock provides you with a quick and easy way to see what sites such as Twitter, Flickr and eBay are showing. 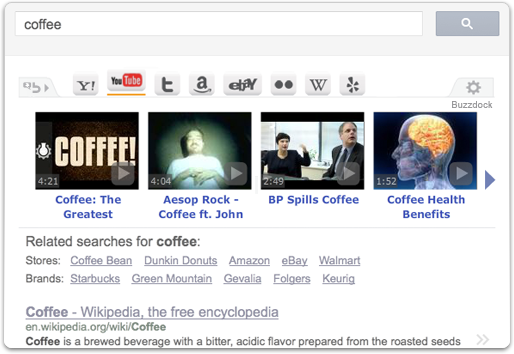 Click any of the icons within the Buzzdock’s Search Enhancer to see that sites top results for your search term. Whether you're searching for something specific, or just looking for something cool, Buzzdock can help you get there! How does Buzzdock Inline work? Buzzdock Inline is a free add-on feature to Buzzdock that allows you to highlight text on any website and easily jump to Google, Wikipedia, YouTube, Dictionary.com,or Twitter to get relevant info. Just highlight the text and options to search across various sites will appear. One click gets you to your desired destination with the search already done for you. I installed Buzzdock, now what do I do? We are in the process of adding more sites so visit us often. Once it is installed, go to Google for enhanced search results. Buzzdock is a light-weight, downloadable application designed to enhance your search experience. With Buzzdock installed, you can quickly view top search results from your favorite websites without having to open multiple tabs and/or windows. What browsers does Buzzdock work on? Buzzdock is available on all of the major web browsers. What operating systems is Buzzdock compatible with? Buzzdock currently works with most versions of Windows or Mac. For optimal performance, we suggest using the latest version of Windows or Mac. Check out the FAQ/Support page.